People all over the world have believed in the influence of the planets on human life and history. Logically speaking, the creation of the planets precedes that of the living beings. Hence, some sort of cause and effect relation must subsist between these two. This seems to be the basis for this belief. As per traditional list, the nine planets are Ravi or Surya (Sun), Soma or Chandra (Moon), Mangala, Kuja or Angaraka (Mars), Budha (Mercury), Brhaspati or Guru (Jupiter), Sukra (Venus), Sani (Saturn), Rahu and Kethu. The seven days of the week have derived their names from the first seven planets. Rahu and Kethu are not planets but ascending and descending nodes of the moon. 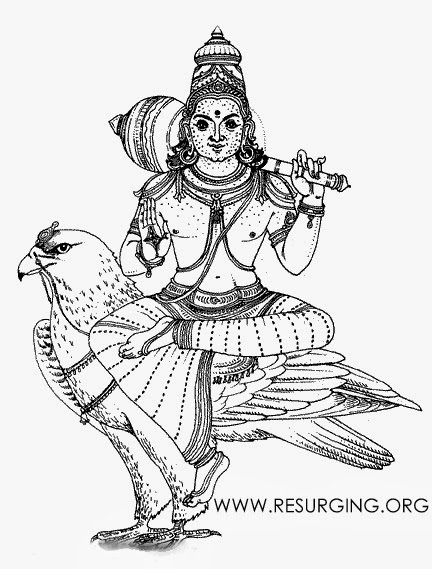 Sometimes Ketu is depicted as the personification of comets and meteors. Sani, Rahu and Ketu are considered inauspicious, even positively maleficent, and responsible for childrens diseases. Hence they need to be propitiated. The nine planets are invariably found in every Saiva temple in South India. In many North Indian temples they are depicted on the lintels of doors, to protect the temple and all those who enter it. They may also be housed in a separate Mandapa (a small pavilion) or at least a platform where the images of these nine Grahas are installed in such a way that no two of them will face each other. It is sometimes stated that the images of the planets are set up in the temples in the order in which they are zodiacal circle at the time of construction of the temple. All the navagraha have relative movement with respect to the background of fixed stars in the zodiac. This includes the planets: Mars, Mercury, Jupiter, Venus, and Saturn, the Sun, the Moon, as well as positions in the sky, Rahu (north or ascending lunar node) and Ketu (south or descending lunar node). 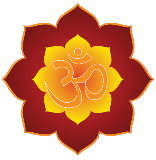 According to some, Grahas are the "markers of influence" that point out the karmic influence on the behavior of living beings. They themselves are not causative elements but can be compared to traffic signs. Surya must always be placed in the centre of the planets, facing east, with the other Grahas fixed round him, each in a specified direction. He has two hands, holding a lotus in each. His chariot has one wheel, is drawn by seven horses and has Aruna (deity of the dawn) as the charioteer. Soma or Candra has only a face and two hands but no body. He is shown holding white lotuses in his two hands. He rides on a two or three wheeled chariot drawn by ten horses. Budha also has four hands, thre of them wielding the weapons sword, shield and mace. The last hand shows the Varadamudra. He rides on a lion or a chariot drawn by four horses. Brhaspati, being the Guru, is shown holding a book and a rosary in his two hands. His chariot is golden and is driven by eight horses. Sukra is also seated in a golden chariot drawn by eight horses or in a silver one drawn by ten horses. 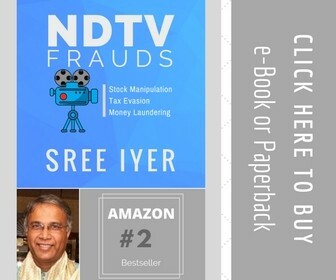 He has two hands holding a Nidhi (treasure) and a book. Some times he is shown with four hands holding the staff, rosary and waterpot, the fourth exhibiting the Varadamudra. Sani rides in an iron chariot drawn by eight horses. He is more often shown as riding on a vulture. A buffalo also may be his mount. He holds the arrow, bow and javelin in three of his hands, the last hand being in the Varada Mudra. Rahu is usually described as having only a face and Ketu is depicted like a serpents tail. Iconographical works, however, describe them differently. Rahu may be shown riding a black lion or as seated on a Simhasana (throne) or in a silver chariot drawn by eight horses. He may have two hands, the right hand carrying a woolen blanket and a book, the left hand being shown empty. 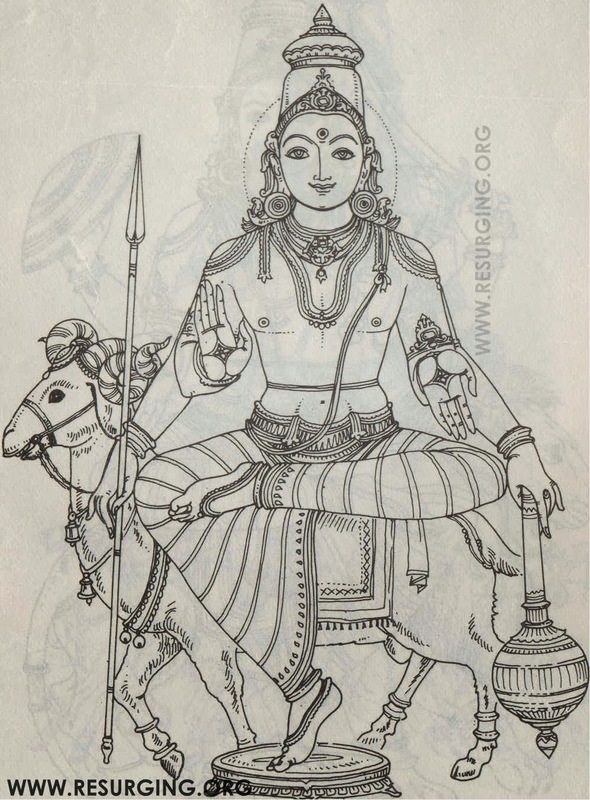 If four hands are shown, they can carry sword, shield and lance, the fourth one being in Varadamudra. Ketu has an ugly face and rides on a vulture. In his two arms he exhibits a mace and the Varadamudra or Abhayamudra. All the Grahas have crowns and ear rings. The eight grahas round the Sun always face him. The planets are sometimes described as having connection with the incarnation of Lord Visnu.